The Workers’ Party distributed more than 3,000 leaflets in Cork city centre yesterday (Thursday) and will be on the city’s streets again today as part of its ongoing campaign. The leaflet outlines the background to the current situation and calls on bus users to make their opposition to the cuts known to the government and especially to Transport Minister Shane Ross. The Workers Party campaign will be rolled out in other areas of the country in the coming days and weeks. Workers’ Party Councillor Ted Tynan said that the current crisis at Bus Éireann has been entirely manufactured by the government and senior company management as part of a wider plan to hand over the most profitable routes to private operators. The company, he said, was wrongly being portrayed as a drain on the economy when in fact it receives less state funding than the private horse racing industry. 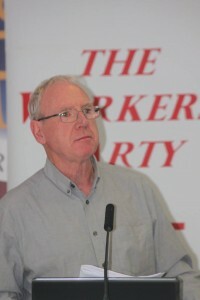 The Workers’ Party campaign is being co-ordinated by John Bowen, a retired Bus Éireann employee and an ex- president of Cork Council of Trade Unions.